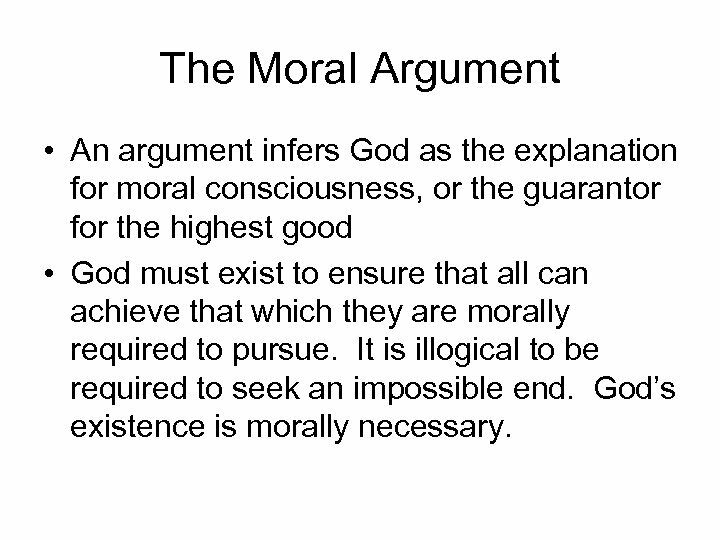 The Moral Argument • An argument infers God as the explanation for moral consciousness, or the guarantor for the highest good • God must exist to ensure that all can achieve that which they are morally required to pursue. 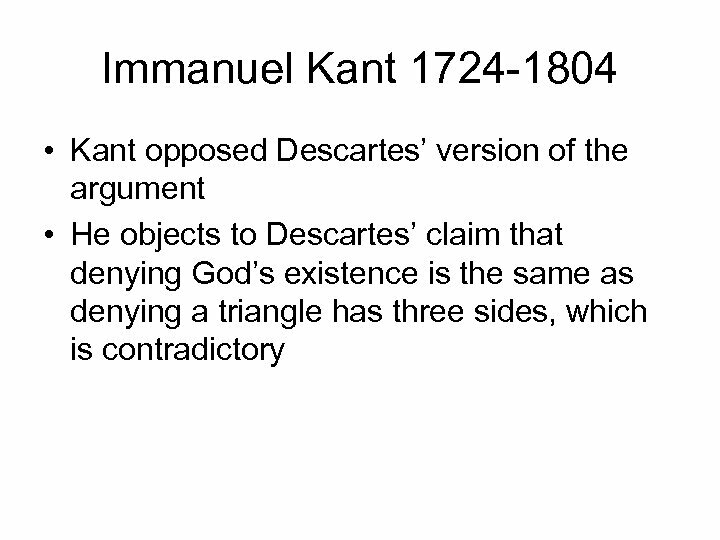 It is illogical to be required to seek an impossible end. 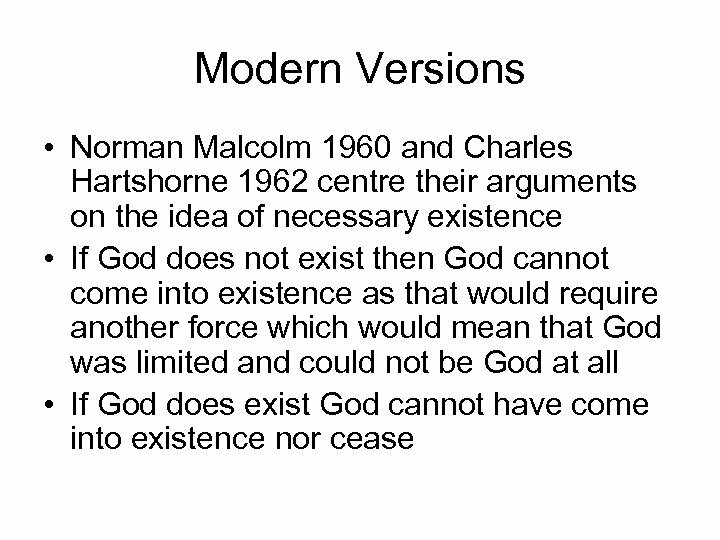 God’s existence is morally necessary. 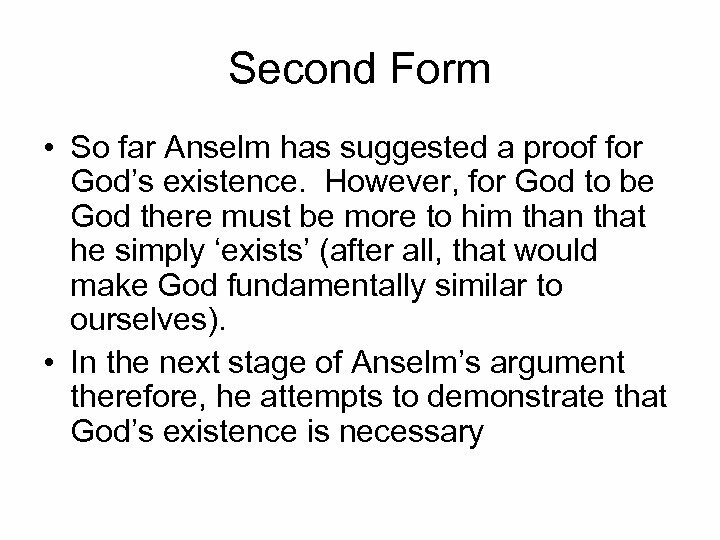 First Form • Anselm says: “God is that than which nothing greater can be conceived. 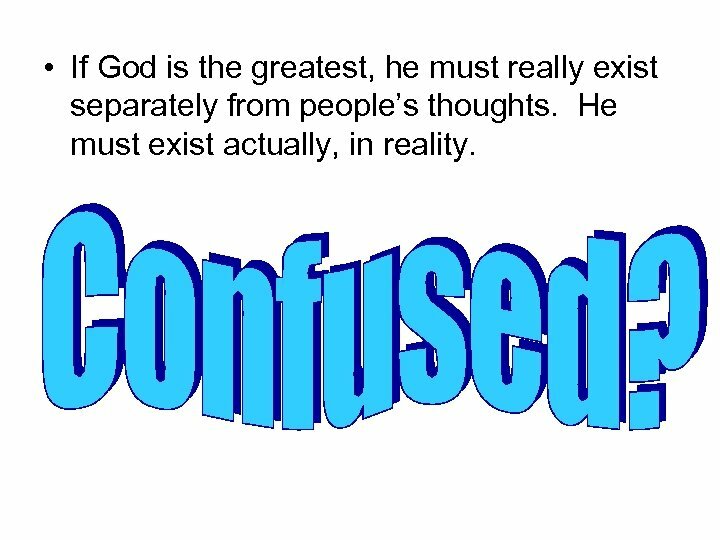 ” • Something that exists in reality is greater than something that exists only in the mind • In other words, if it is the greatest, then it must be something more than merely existing in people’s thoughts. 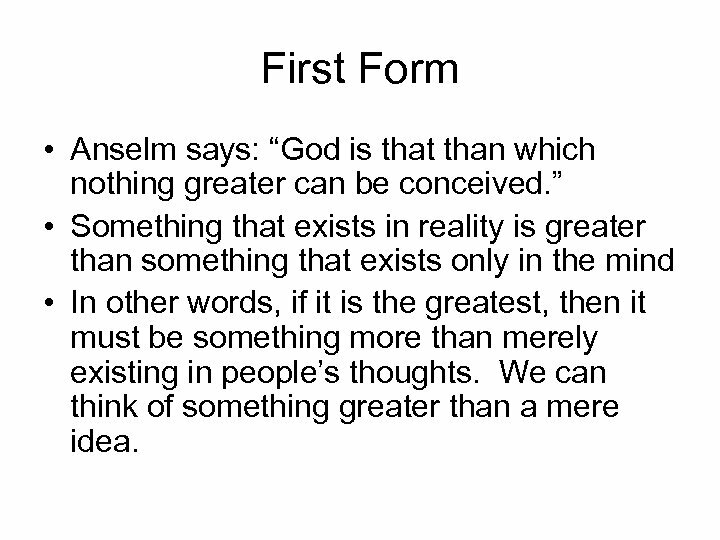 We can think of something greater than a mere idea. 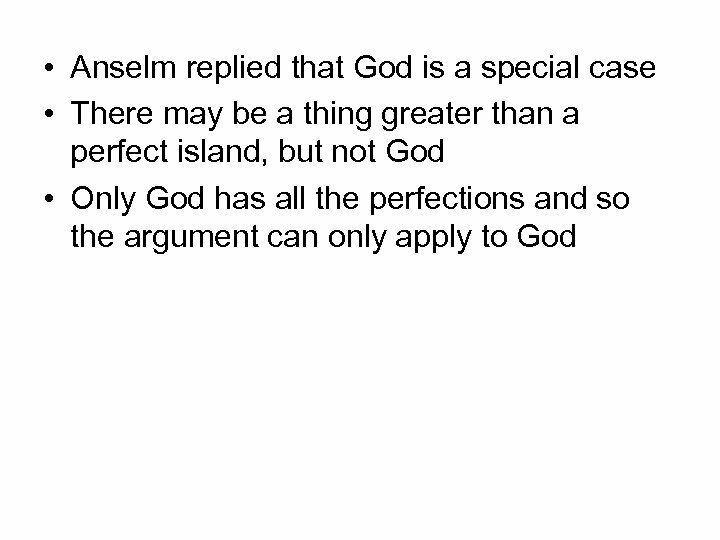 • If God is the greatest, he must really exist separately from people’s thoughts. 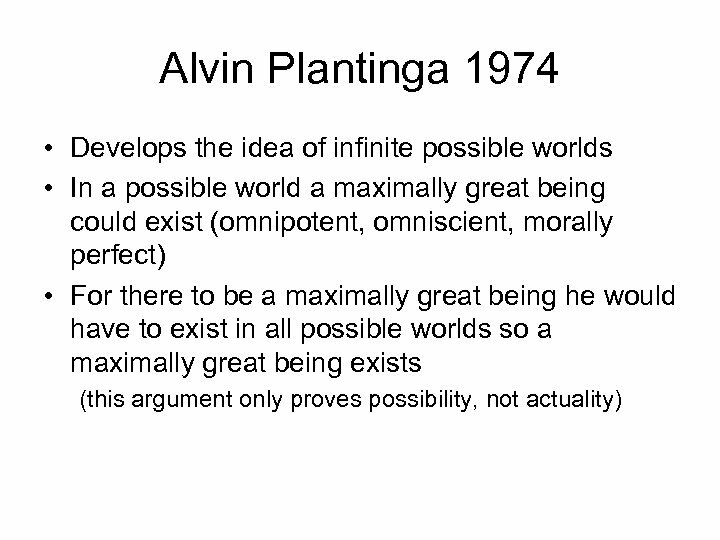 He must exist actually, in reality. 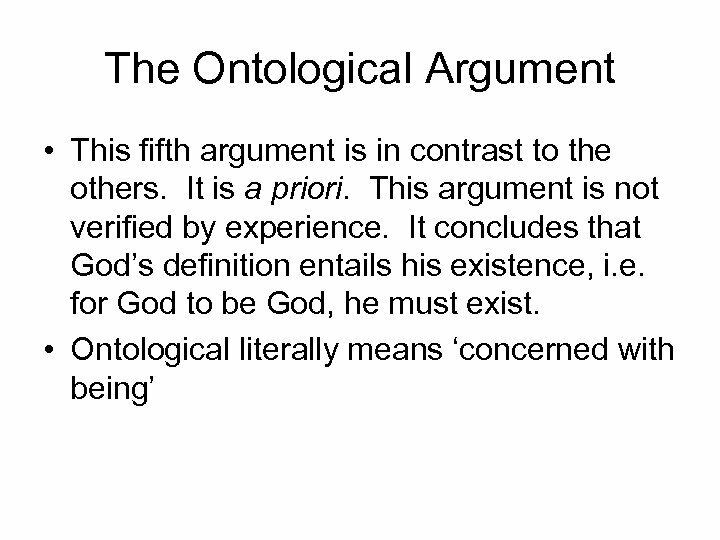 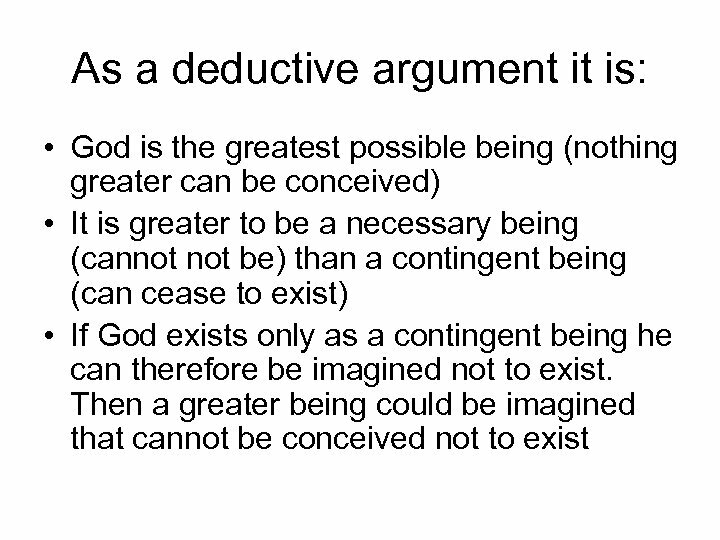 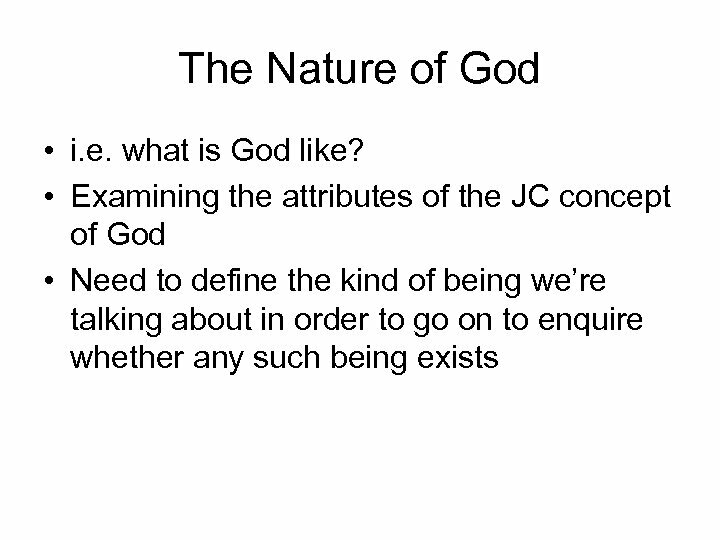 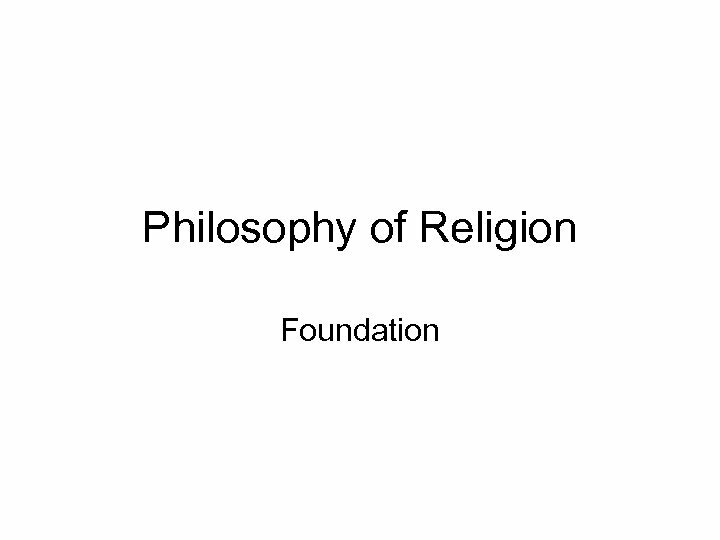 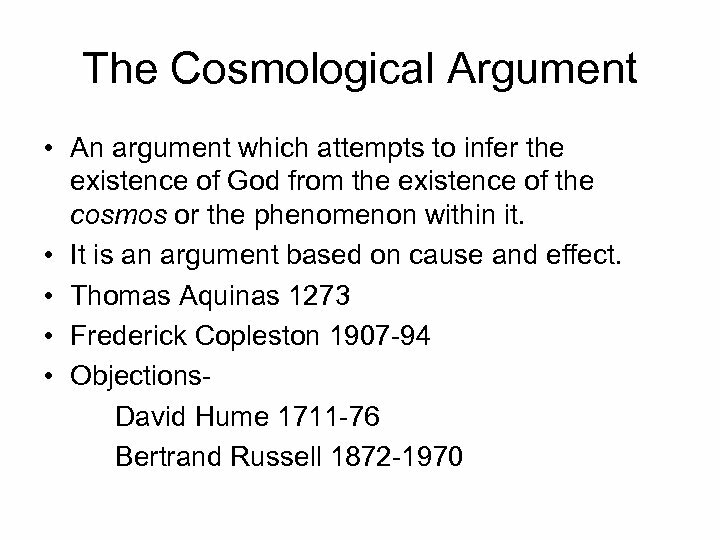 As a formal deductive argument, it goes like this: Ø God is the greatest possible being (nothing greater can be conceived) Ø If God exists in the mind alone (only as an idea) then a greater being could be imagined to exist both in the mind and in reality Ø This being would then be greater than God Ø Thus, God cannot exist only as an idea in the mind. 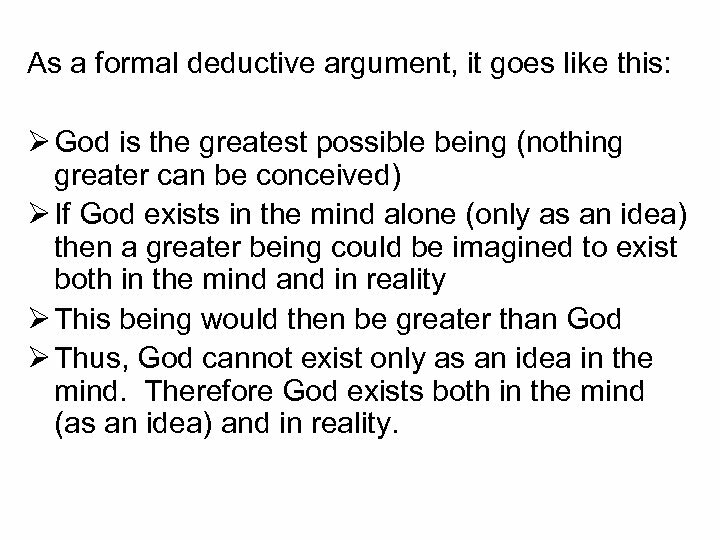 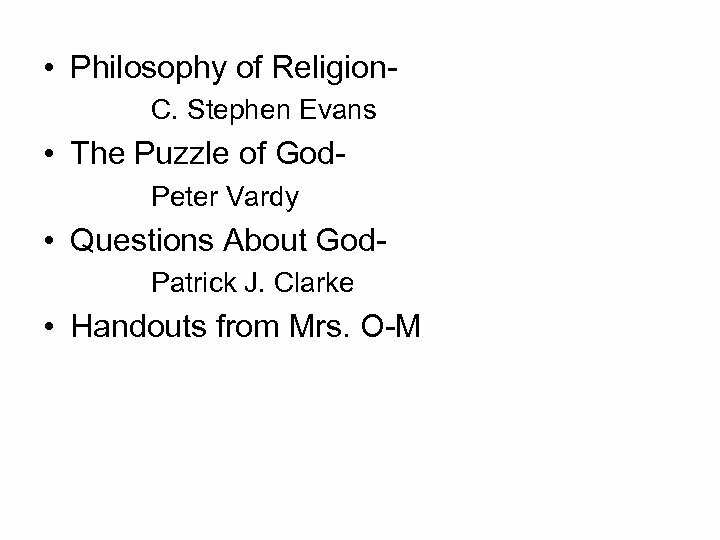 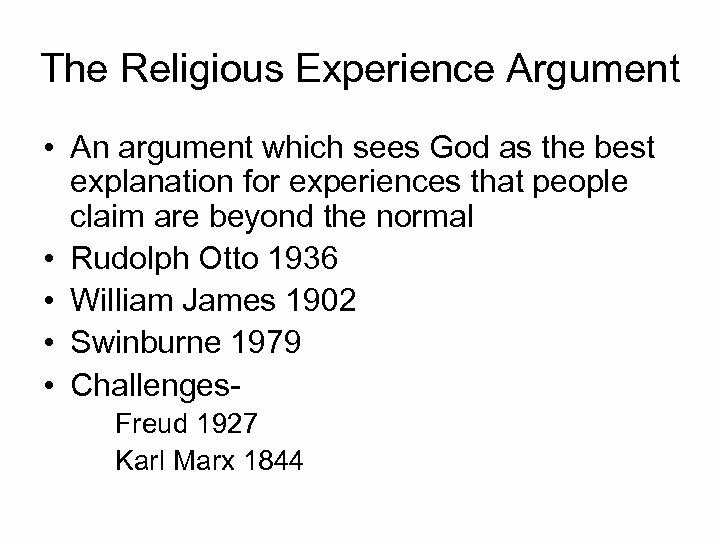 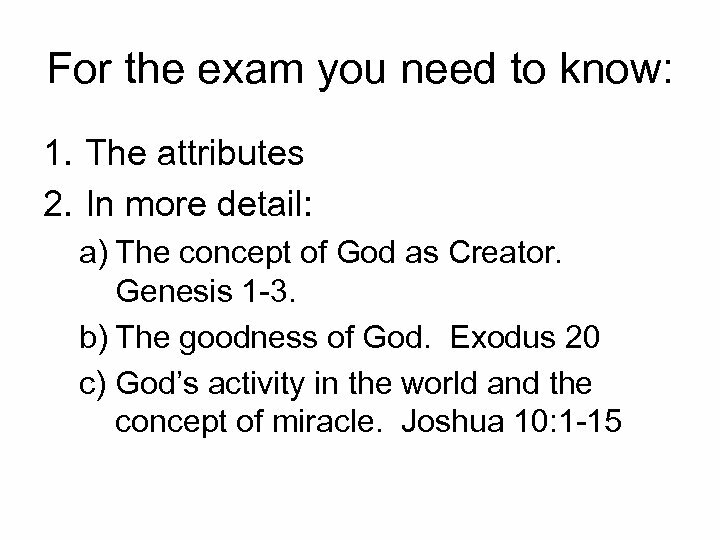 Therefore God exists both in the mind (as an idea) and in reality. 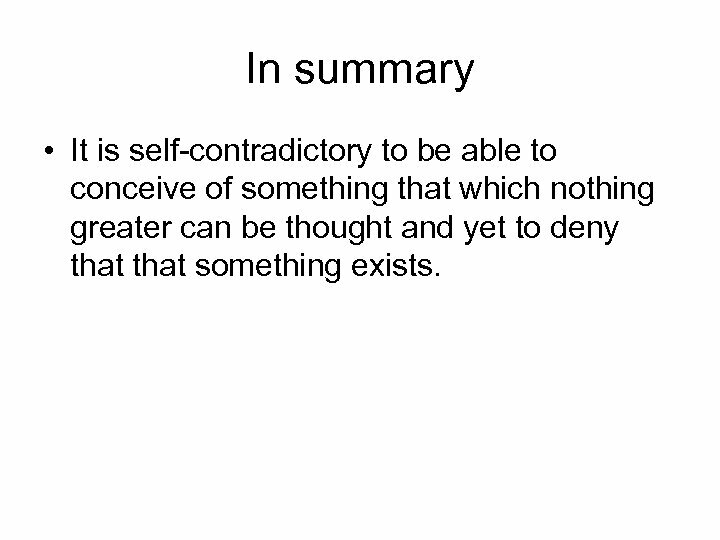 In summary • It is self-contradictory to be able to conceive of something that which nothing greater can be thought and yet to deny that something exists. 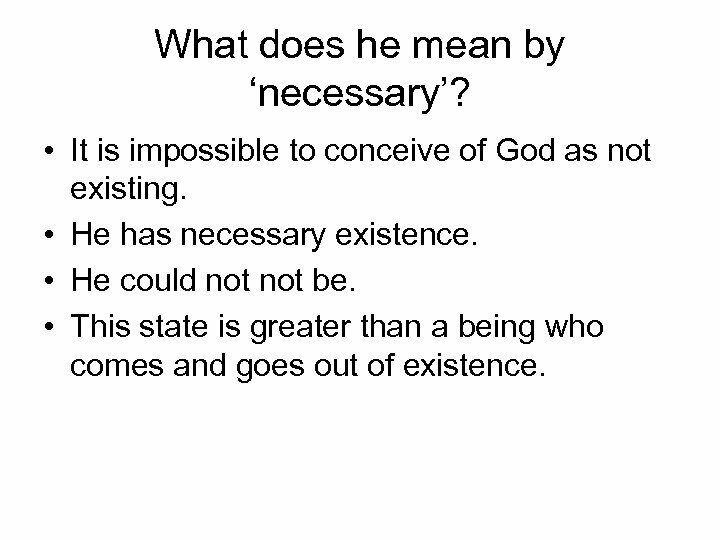 What does he mean by ‘necessary’? 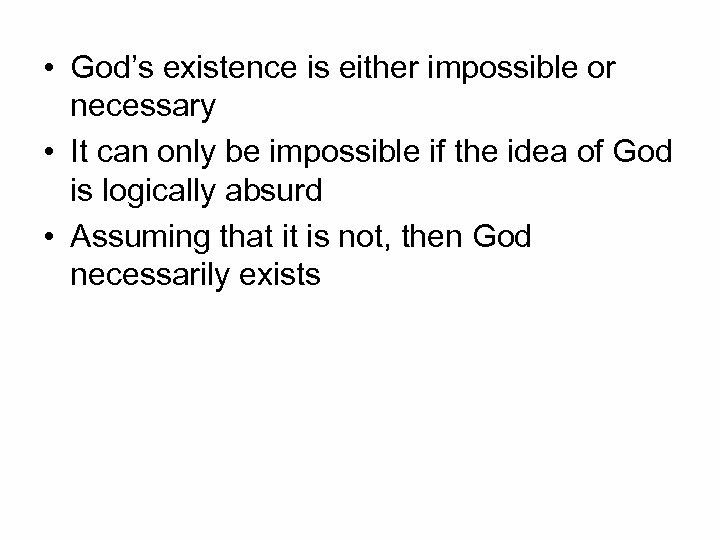 • It is impossible to conceive of God as not existing. 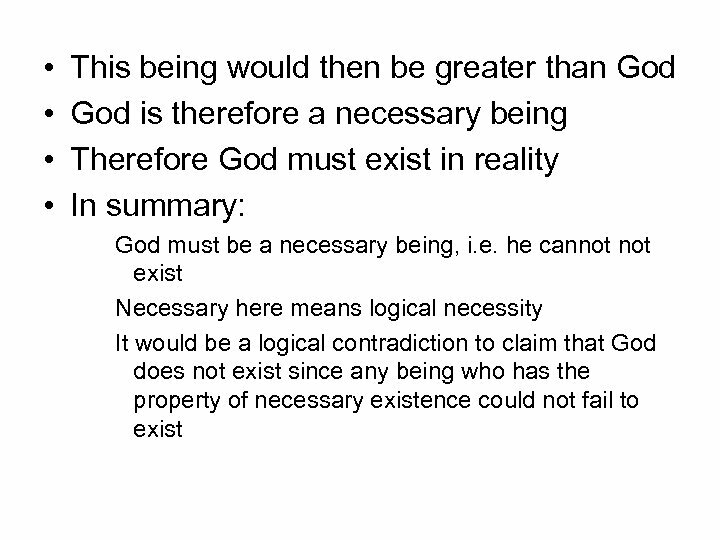 • He has necessary existence. 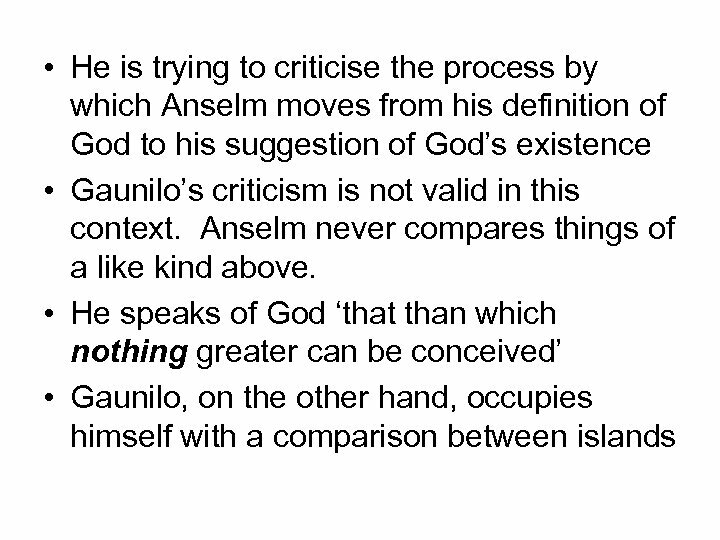 • He could not be. 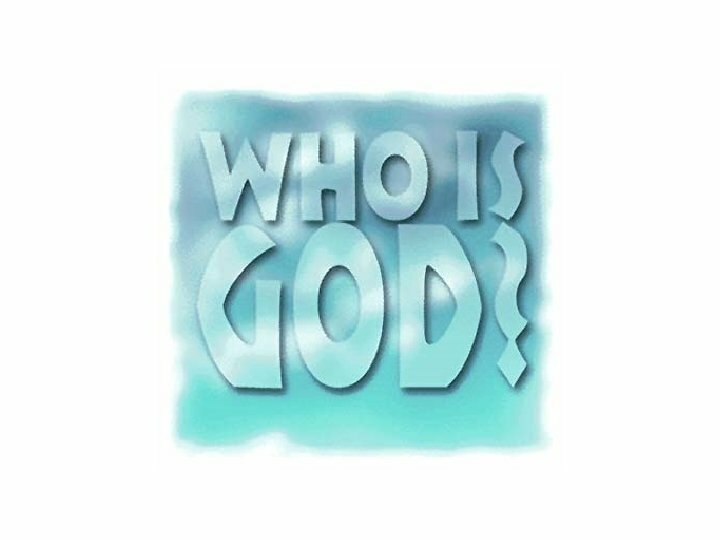 • This state is greater than a being who comes and goes out of existence. 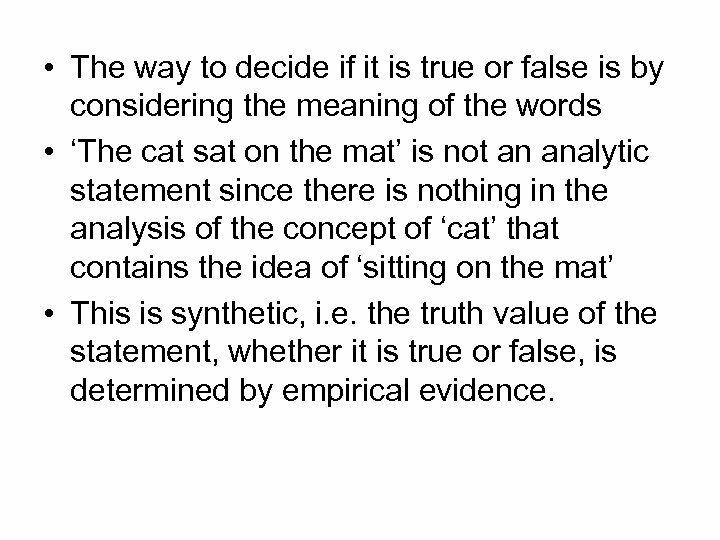 • The way to decide if it is true or false is by considering the meaning of the words • ‘The cat sat on the mat’ is not an analytic statement since there is nothing in the analysis of the concept of ‘cat’ that contains the idea of ‘sitting on the mat’ • This is synthetic, i. e. the truth value of the statement, whether it is true or false, is determined by empirical evidence. 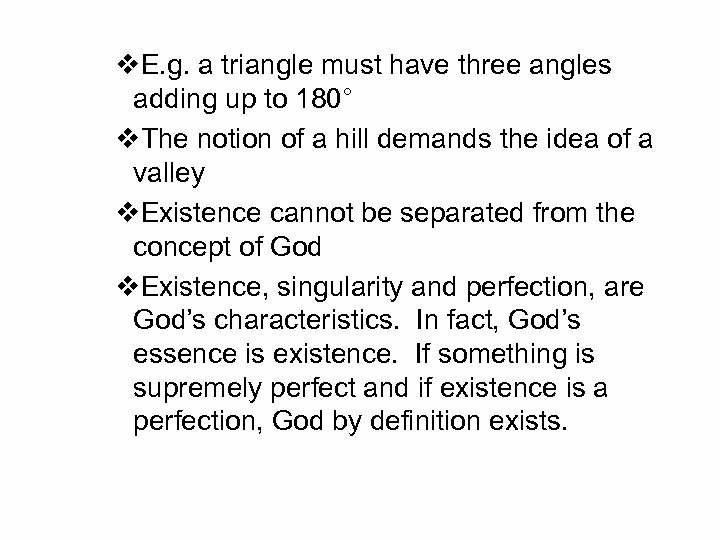 v. E. g. a triangle must have three angles adding up to 180° v. The notion of a hill demands the idea of a valley v. Existence cannot be separated from the concept of God v. Existence, singularity and perfection, are God’s characteristics. 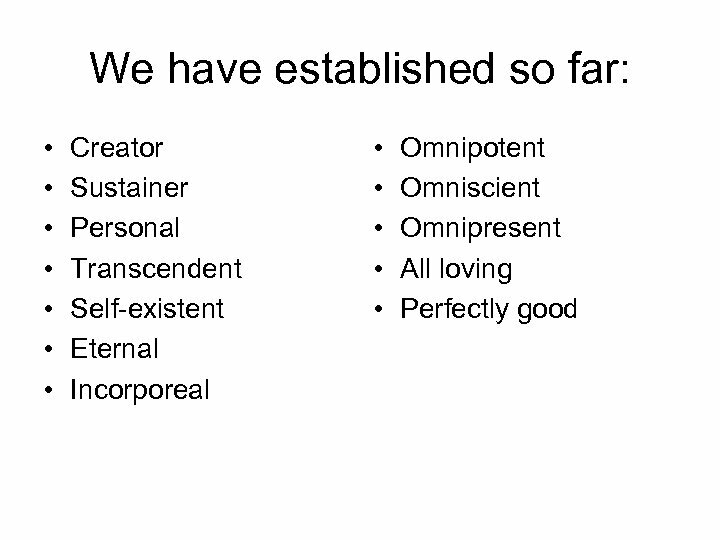 In fact, God’s essence is existence. 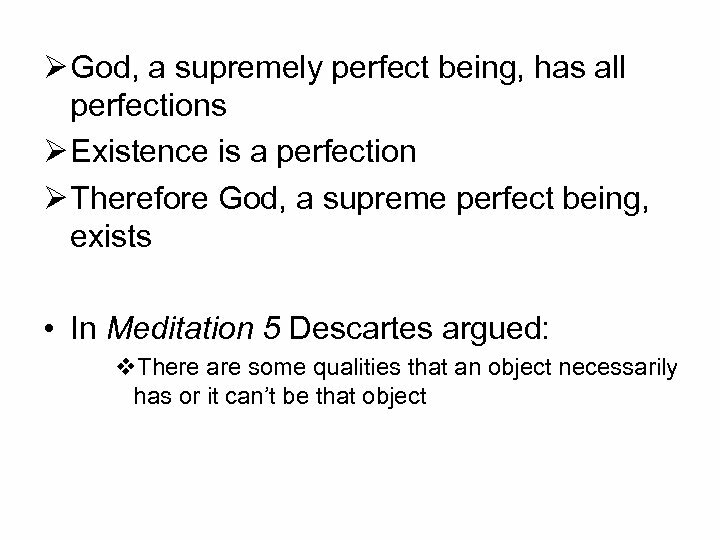 If something is supremely perfect and if existence is a perfection, God by definition exists. 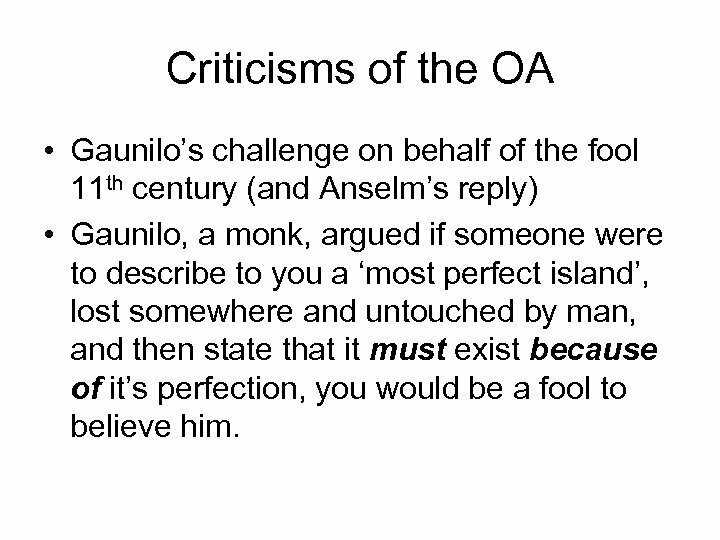 Criticisms of the OA • Gaunilo’s challenge on behalf of the fool 11 th century (and Anselm’s reply) • Gaunilo, a monk, argued if someone were to describe to you a ‘most perfect island’, lost somewhere and untouched by man, and then state that it must exist because of it’s perfection, you would be a fool to believe him. 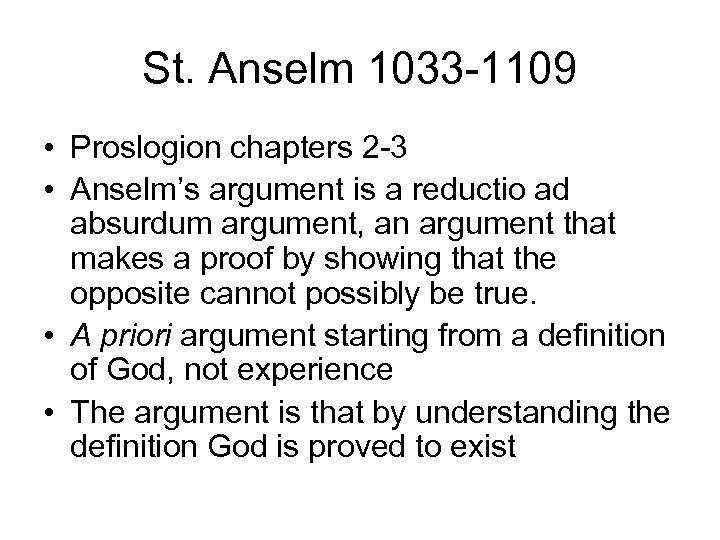 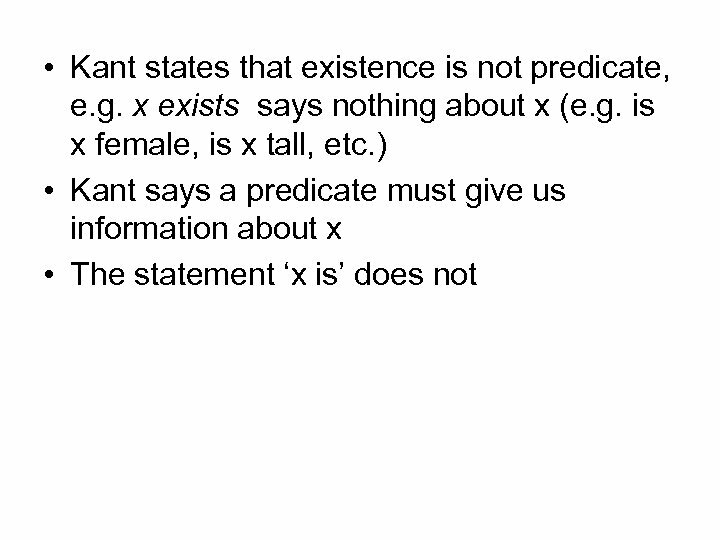 Bertrand Russell • 20 th century philosopher • Claims that Anselm uses the word exist incorrectly • Existence cannot be a predicate, if it were we could construct this argument: Men exist. 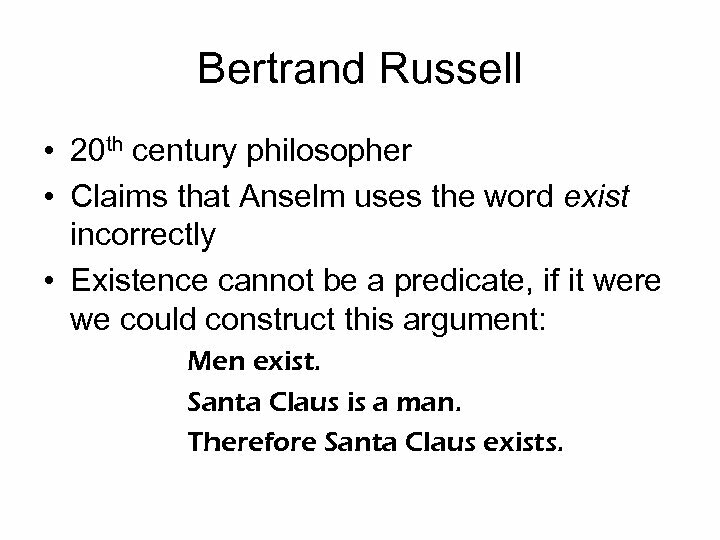 Santa Claus is a man. 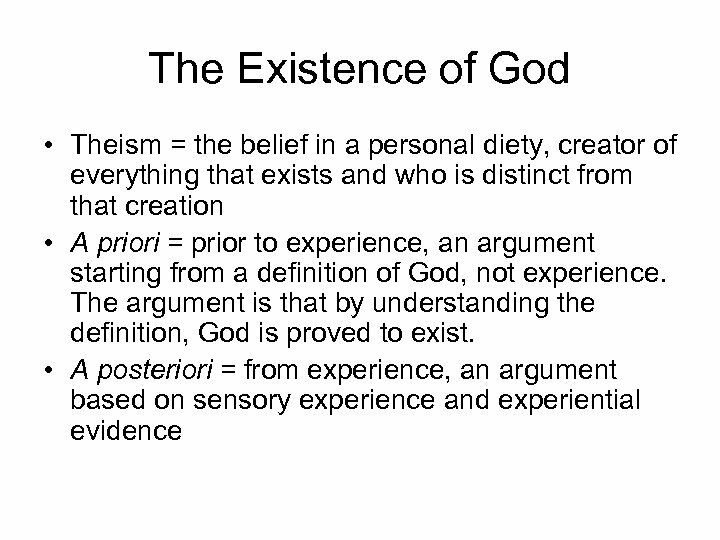 Therefore Santa Claus exists. 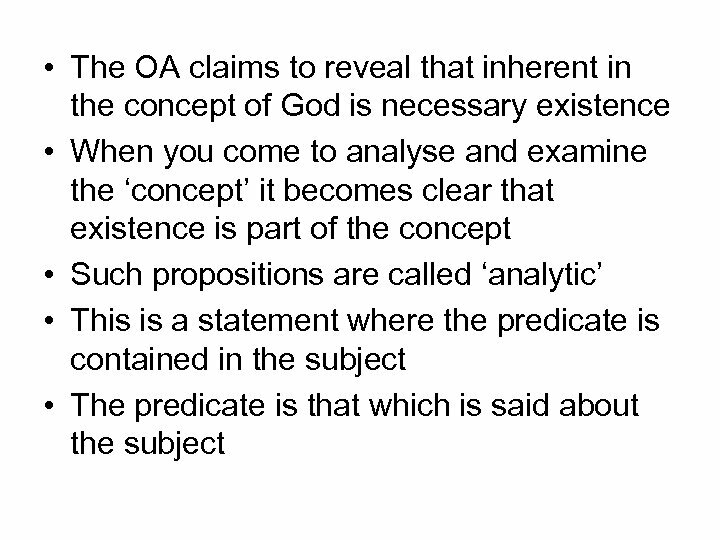 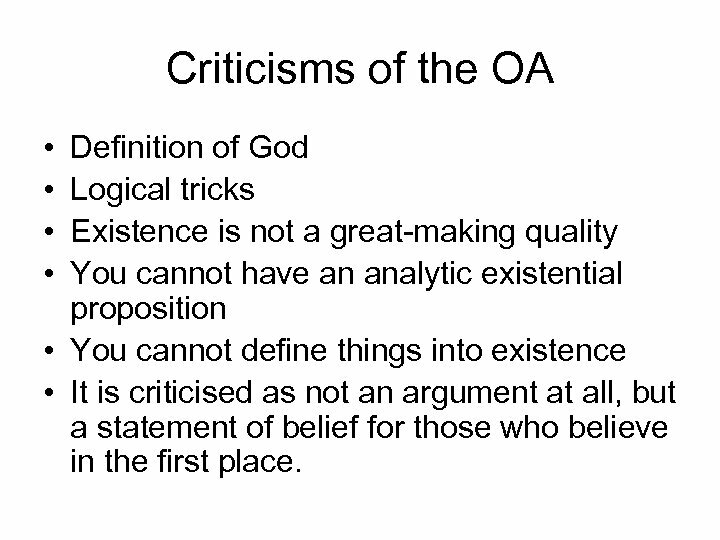 Criticisms of the OA • • Definition of God Logical tricks Existence is not a great-making quality You cannot have an analytic existential proposition • You cannot define things into existence • It is criticised as not an argument at all, but a statement of belief for those who believe in the first place. 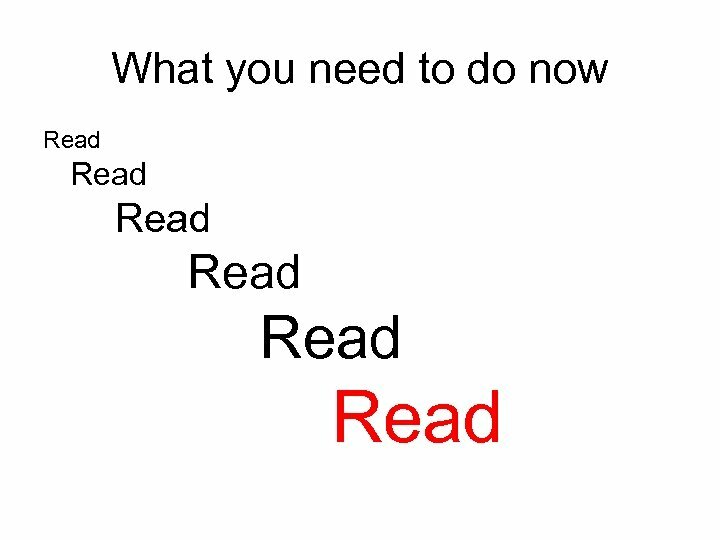 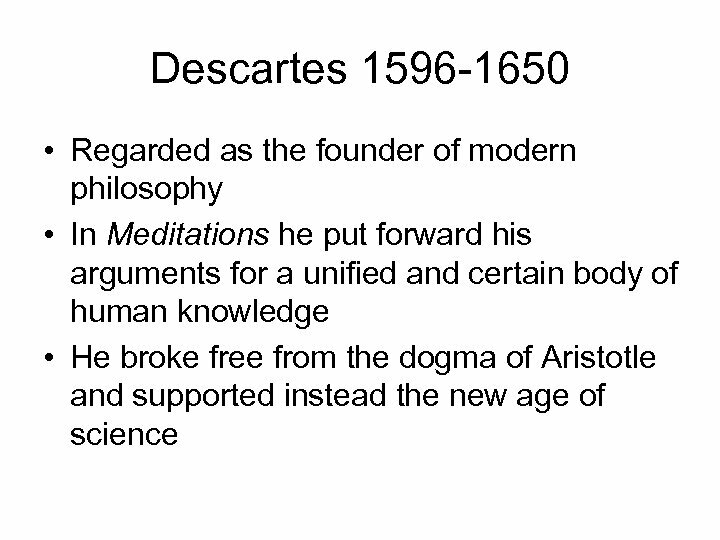 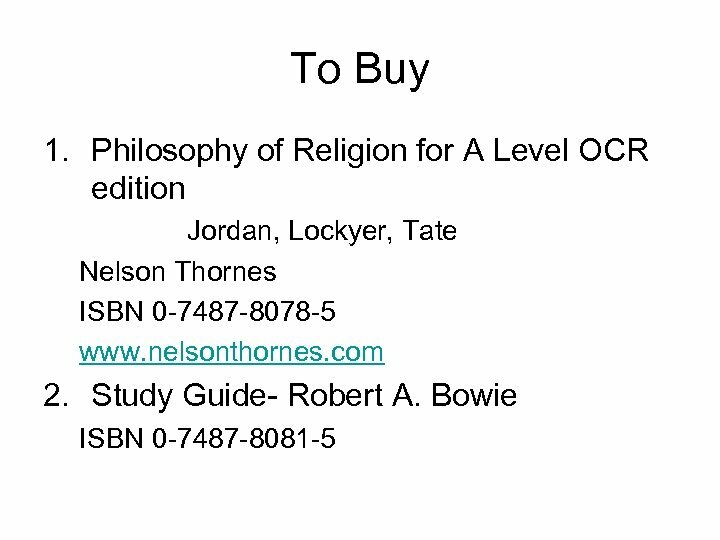 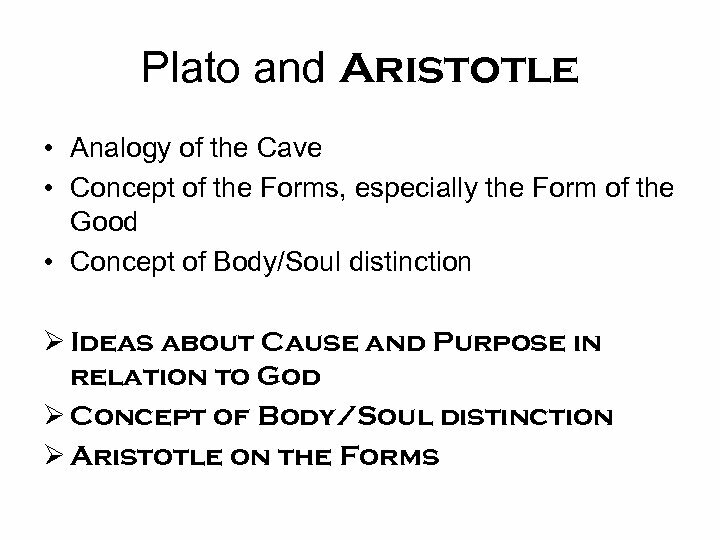 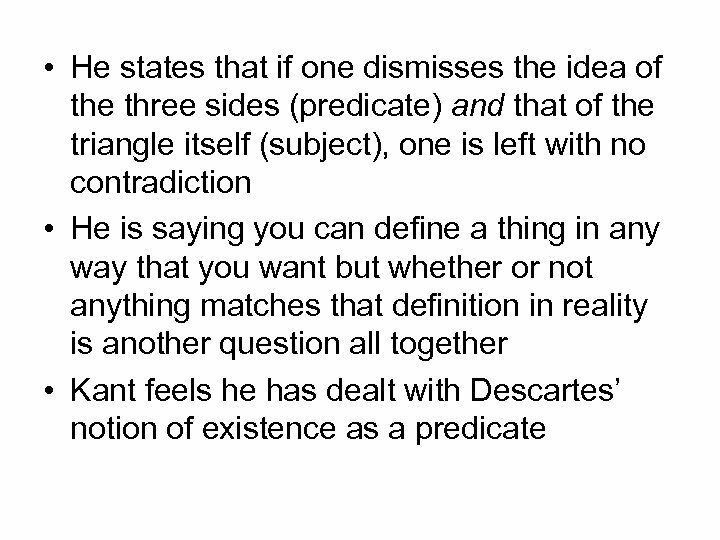 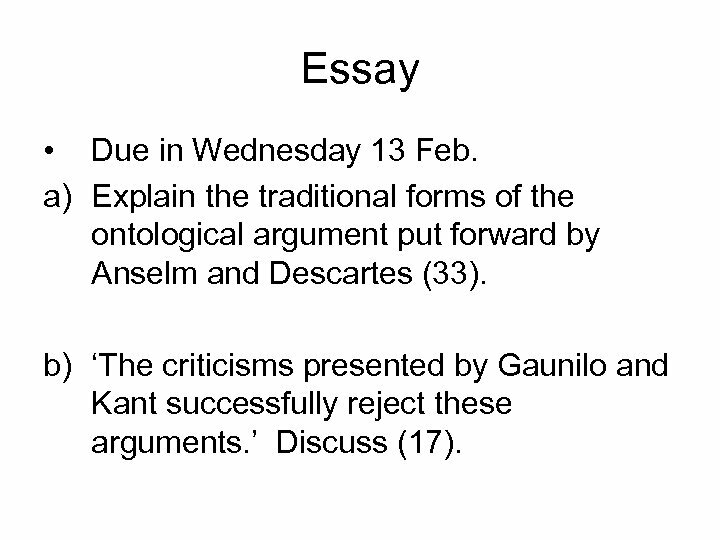 Essay • Due in Wednesday 13 Feb. a) Explain the traditional forms of the ontological argument put forward by Anselm and Descartes (33). 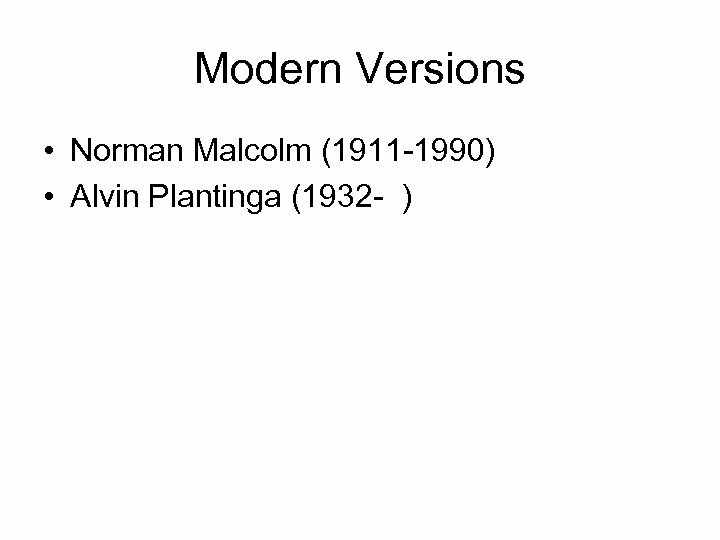 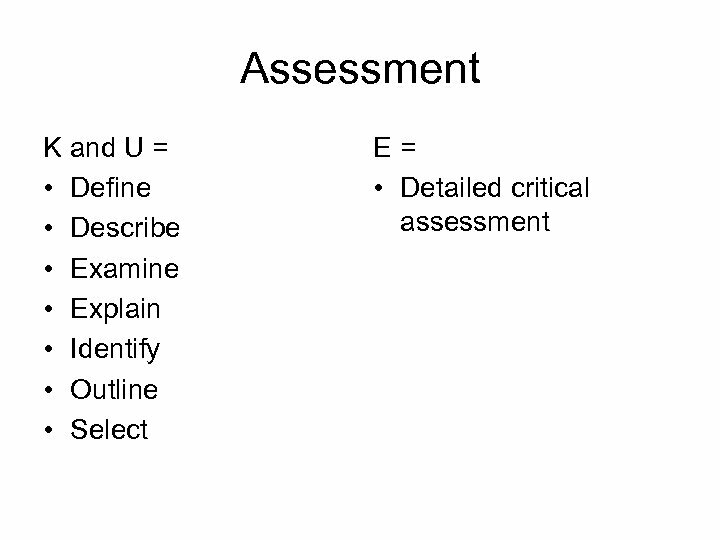 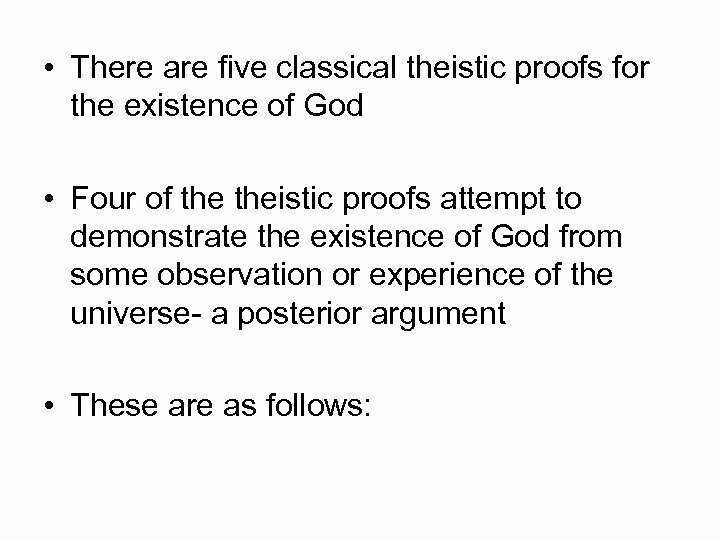 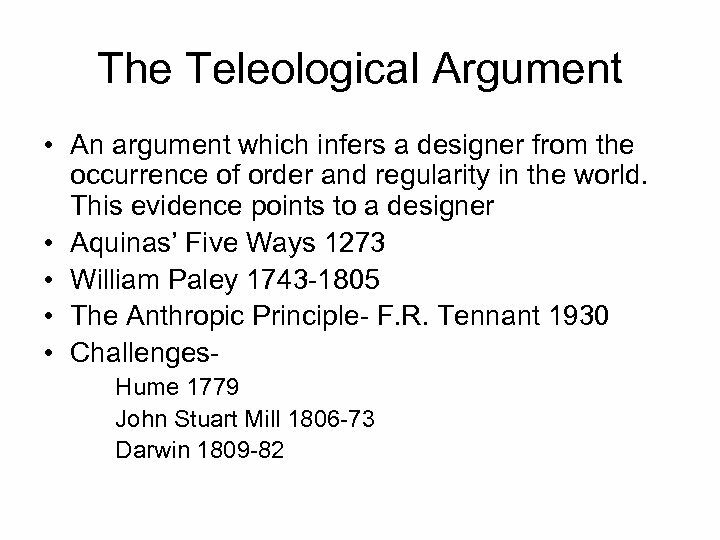 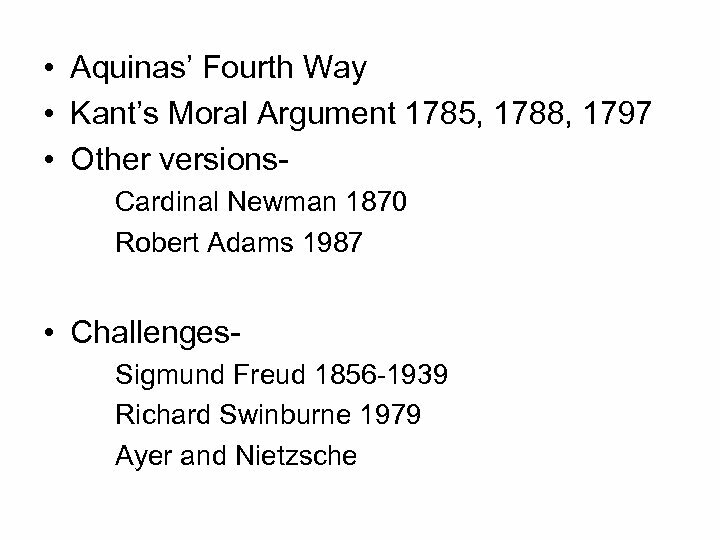 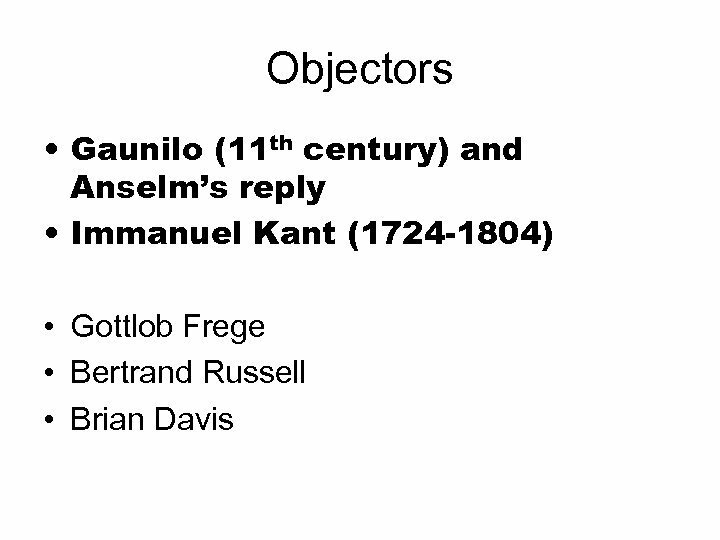 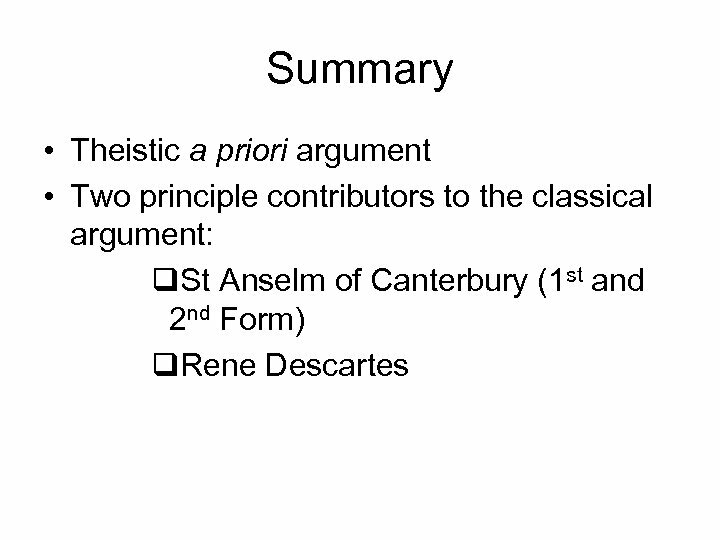 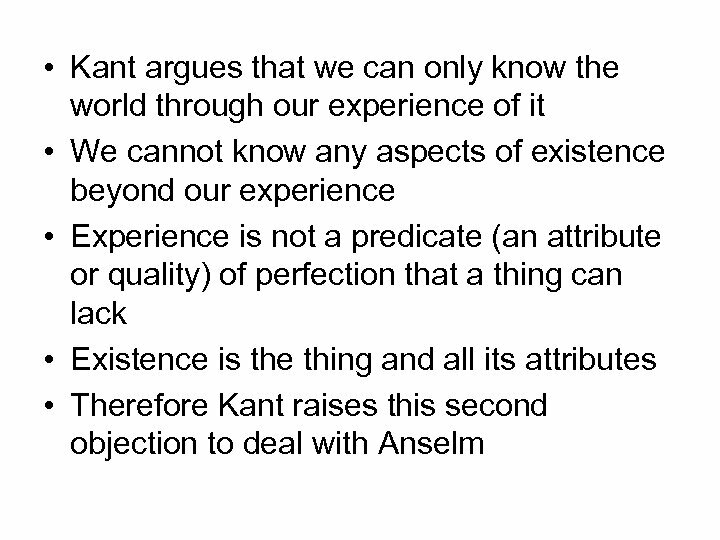 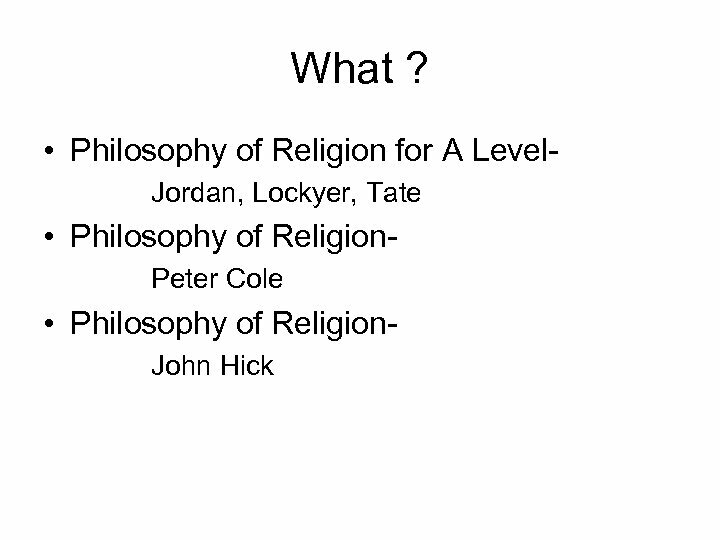 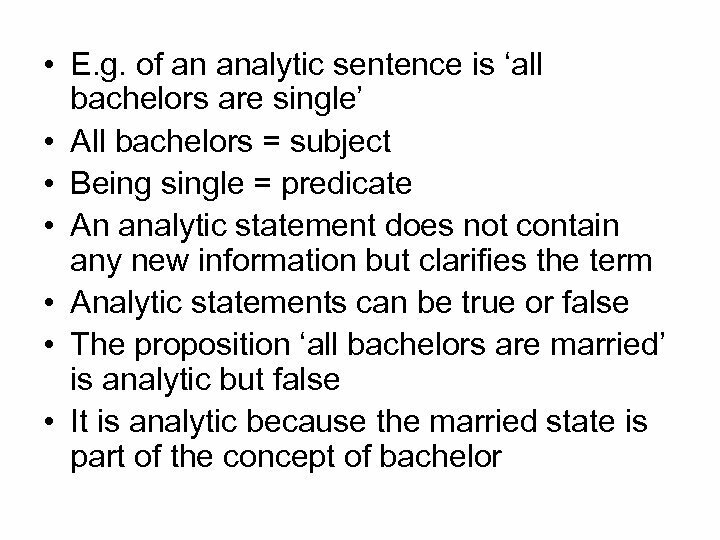 b) ‘The criticisms presented by Gaunilo and Kant successfully reject these arguments. 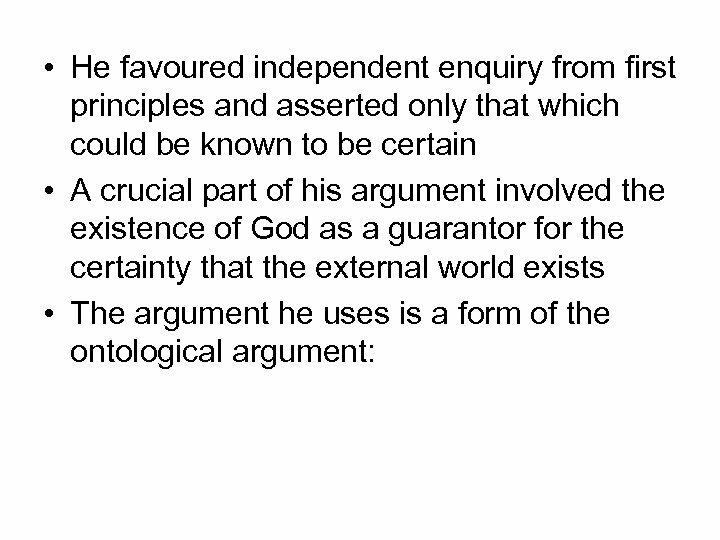 ’ Discuss (17).